1 3/4" Diameter embossing seal. 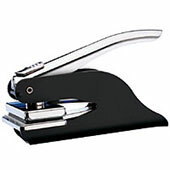 Portable Pocket Custom Embosser includes carrying pouch. Customized with your custom text, logo or image. Available in BLACK HANDLE only.